Looking for cheap and effective decorations for your next party? Try our Latex Balloons! Decorating on a budget? No problem, our latex balloons are inexpensive, and easy to inflate. Latex balloons have become the world wide symbol for party, so pick some up today! Latex balloons are decorations that are suitable for almost any occasion. We offer a wide selection of balloons, so you are sure to find some to fit your party needs. Throwing a birthday party? We have balloons in a variety of different colors, browse through our selection of Solid Colored Balloons! 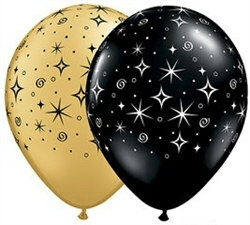 Or try our Happy Birthday Latex Balloons, which have cute birthday designs printed on each of them. Looking for something with a bit more eye appeal? We offer many different decorative latex balloons for themed parties. For casino parties, inflate our Casino Latex Balloons, neatly decorated with dice and playing cards. For anniversaries, we offer elegant gold and silver latex balloons, with special Silver 25th Anniversary Balloons, and Gold 50th Anniversary Balloons. All of these latex balloons can be inflated by hand, or inflated with helium. Regardless of what kind of latex balloons you're looking for we've got you covered right here at PartyCheap.com! Everybody knows that balloons are popular for kids' birthday parties and holiday spectaculars, but there are tons of other ways that you can use latex balloons! How about using one of our top five unconventional ways to use latex balloons at your next social gathering? 1. ABC Party Costume: Have you ever heard of an anything but clothes party? These parties are especially popular for college students. At these parties, you make your own costumes out of unconventional items. You can wear anything--but clothes! One popular way to use balloons for this kind of costume is to gather a bunch of Lavender Latex Balloons and turn yourself into a bunch of grapes! Another great ABC party costume made from latex balloons is a bubble bath costume! Cover yourself in White Latex Balloons and Light Blue Latex Balloons to look like bubbles. Then add a shower cap and carry a loofah and you'll be ready to go! 2. Balloon Column or Balloon Arch: Instead of tossing balloons all over your floor and risking them popping, you can decorate your already there walls, columns, and arches with balloons. Pick complementary colors and tape of glue them in different patterns to the arches and columns in your party venue. This is especially popular for weddings and receptions. 3. Use Balloons for Dessert: Wait, don't try to eat the balloons! Use them to help you make a dessert that is sure to make a huge impression on your guests! This dessert is popular for all kinds of parties and occasions. Blow up a latex balloon and use it as a mold. Melt some chocolate and place it around the balloon. When the chocolate hardens, pop the balloon and pull it out. You'll have crafted an edible chocolate bowl! Then, fill the bowl with ice cream, cake, you name it! 4. Balloon Art: This fun idea can be seen in the movie The Princess Diaries. Kids love this idea and it is great for birthday parties! Make a fun souvenir from your kid's birthday party to hang in his or her bedroom! Fill balloons with different colors of paint and tape or pin the balloons to a giant canvas. Then play a game of darts! Have fun popping the balloons and watching paint go everywhere! See who can pop the most balloons or make the biggest rainbow mess! Just make sure that there is adult supervision if the kids playing are too young! 5. Paper Mache: This is an extremely popular kids craft. Make it at birthday parties for a fun activity for kids to take part in. You can also make it before a party to make a pinata! Cut newspaper into strips and mix flour and water to make a paste. Dip the newspaper into the mixture and place it on an inflated balloon. After the newspaper dries, pop the balloon and pull it out. Decorate your pinata and fill it up with candy and other goodies! Try our Festive Pinata Filler! No matter what kind of latex balloons you're in need of we've got you covered right here at PartyCheap.com!